Thank you so much for all of your love and support today. The doctor appointment went well. Baby is healthy. It even had the hick ups. The new due date is January 30th. 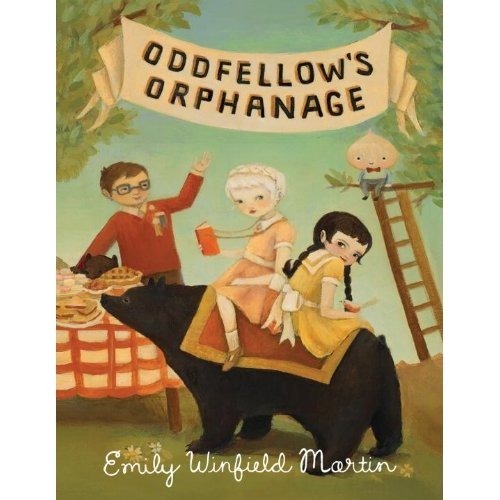 Just in time for the new Emily Martin book, Oddfellow Orphanage, to arrive for baby (me). Great news! :) Best Best Wishes! And hooray for Emily's new book! I'm so happy to hear that sweet baby Morris is healthy. I have had you in my thoughts all day and have been saying little prayers for you. Hugs! Oh how wonderful!!!! I know you must be over the moon to know the gender too! I'm thrilled to bits and pieces for you, Dan & Bono that Baby Morris is healthy and no doubt extremely adorable! Is there a huge difference between baby this time? I still have 6 days til my scan and I'm so excited! I can't wait to see our precious Baby Woo once more! I was so scared about having twins. Thankfully, there is only one baby in there. Dan asked just to make sure. This is the first time we have seen the baby. It was crazy. I think I am still processing the whole event. For me, it just seems more real. There really is a little baby in there kind of thing. I can't wait for your scan next week. You are going to be the cutest Mommy ever. Please let me know if you need anything. I may be across the pond but I am here for you always. ooh you never know s/he might share a birthday with rowan! (jan. 27). i just really can't tell you how thrilled i am for you all!